Julie Smith flipped through a memory book she had made for Ashley Burgauer and landed on a page full of handwritten letters. She explained that in order to truly know Ashley was to hear her voice through her writing. Julie made this memory book for Ashley’s 25th birthday. At that point, the friends had known each other for 20 years. Ashley and Julie met in kindergarten and immediately clicked. Their kindness toward other people, and their quirkiness around each other, is what helped them connect throughout elementary and middle school. Julie felt Ashley’s family was her own, and Kathy Burgauer began to see Julie as a third daughter. Ashley’s mother, Kathy Burgauer, recalls her daughter’s gentle and loving, if not timid, demeanor in high school. Ashley never gossiped. She was kind to everyone, and she hated the limelight even though she was active in cheerleading and dance. Despite being so involved, Ashley hated the attention that came with it. It was also in high school that Ashley started getting sick. She was diagnosed with ulcerative colitis, and she struggled with her health throughout high school. After graduation, she headed to Indiana State University and roomed with Julie. Not long after, Ashley got her colon removed because of her illness and had to move back home. Ashley did not want her career to end there. She was passionate about nursing and about making a difference in people’s lives much like the nurses she’d known made a difference in her own. In 2005, she began classes at Ball State University. Through it all, Kathy and Ed Burgauer offered support for their daughter. At one point in her college career, Ashley was in the hospital when class registration opened, making it difficult for her to register for the next semester. Her dedication paid off. In 2010, she graduated from Ball State with her BSN. She passed her boards on the first try and got a job at IU Health in Indianapolis taking care of patients much like herself. Despite Ashley’s valiant fight, her ulcerative colitis got the better of her. In 2012, her illness forced her to quit her job and move back home to Muncie. As Kathy recalls, Ashley started having chest pains one day. Ashley had a bleeding ulcer once before due to her ulcerative colitis, so she thought that might be the diagnosis. The culprit of the chest pains was unusual, though. On August 29, 2013, Ashley went to her parents’ house with her dog to watch television. She decided to take a nap in their bed, and she never woke up. As it turns out, Ashley’s bleeding ulcer symptoms had actually been those of myocarditis, a sudden death disease that involves the swelling of the heart. Because of the nature of its symptoms, myocarditis often goes undetected until it’s too late. 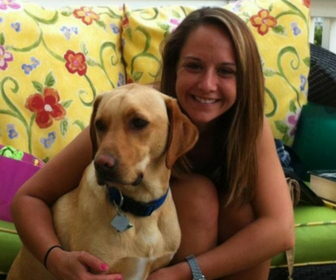 Before Ashley’s death, Julie and her childhood best friend had grown closer. Julie was pregnant when Ashley died, and she went into labor on the day of Ashley’s funeral. Because Julie was unable to attend the funeral, she felt a personal lack of resolution. She wanted to carry on her best friend’s legacy, and she had three months of maternity leave to determine the best way to do that. The Honor Stride is a not-for-profit organization with a mission to raise awareness of myocarditis and to support medical professions. It was established in 2014 by Julie and two of Ashley’s longtime friends, Jessica Minner and Amanda Ford. The organization’s first event was a 5k walk in Ashley’s honor to raise money for the Myocarditis Foundation. The founders soon realized that the intention was right, but the event was wrong for what they were trying to accomplish. They pivoted. The next year, the Honor Stride became a silent auction. It was a zero-cost, all profit event that allowed Julie to raise $5,000 annually in 2015 and 2016. 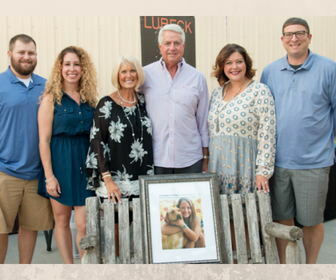 The 2017 event, Uncork with Love, exceeded any expectations Julie had for the Honor Stride. Not only did part of the proceeds from the event go toward the Myocarditis Foundation, it also completed a scholarship fund Julie and Ashley’s family had set up in Ashley’s name using the Foundation’s Acorn program. The Ashley Burgauer Scholarship will make its first award through The Community Foundation of Muncie and Delaware County in 2019. Julie and the Burgauers are looking forward to seeing how the scholarship will impact the Muncie community. It will be awarded to a student who wants to enter the medical field. One of the requirements of the scholarship is for applicants to do research on myocarditis and write an essay about their findings. Like the Honor Stride, this scholarship is meant to serve two purposes. Both Kathy and Julie expressed the importance of giving someone the opportunity to go into nursing and fulfill her passion, much like Ashley did. The Burgauers and Julie chose the Foundation as a vehicle for Ashley’s scholarship fund because of its longevity and trust within the community. The Foundation is also able to keep the scholarship within the community that Ashley loved so dearly. Ashley’s family and friends are excited to see Ashley’s legacy live on during the first scholarship cycle. Now, Ashley’s family sees her impact and her legacy in everything they do. Kathy spoke at the last Myocarditis Foundation national convention, allowing her to spread Ashley’s story past the community to people all over the country who have been directly impacted by the disease. Julie and Ashley’s sister, Amy (who also had a baby shortly after Ashley died), often discuss how much their sons remind them of their best friend and sister. Those closest to Ashley remember her as simple, kind, caring, passionate, sweet and strong, courageous, hardworking, loving, devoted, and faithful. But Ashley’s words are perhaps the most telling of the kind of compassionate, insightful, and encouraging person she was.